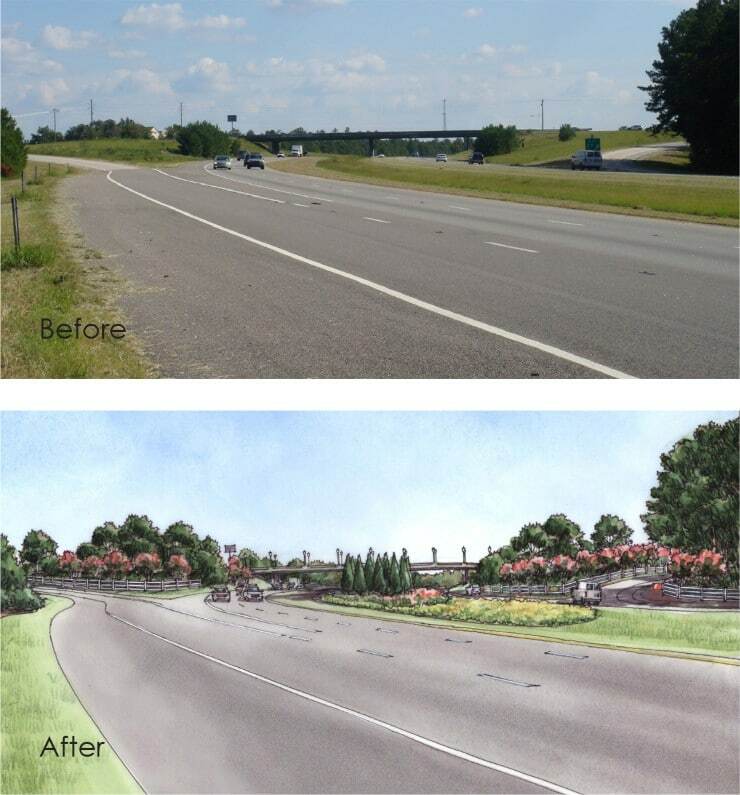 In conjunction with the Town of Blythewood Master Plan, TSW developed a detailed plan for landscaping improvements along I-77. 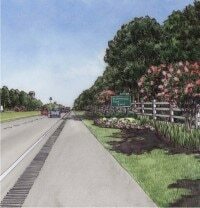 These included both roadside plantings and a more extensive program at the interchange between I-77 and Blythewood Road. The purpose of the improvements was to a convey to drivers along I-77 that they were passing through Blythewood, and to offer an enhanced experience for those exiting the highway. Central to both was a design that drew on the town’s equestrian heritage and high quality of life. Roadside improvements were located within the existing right-of-way and primarily included low maintenance groundcover and crape myrtles. At certain locations, including around the town’s exit sign, additional plantings were proposed. Running along the back of the plantings, a white fence paid homage to the horse farms to the west. At I-77 and Blythewood Road, the roadside design theme was expanded to include the entire interchange. In addition, plantings in the median were added to create a visual cue to drivers on the otherwise monotonous roadway. At the top of each ramp, opportunities were created for directional signage. The interchange landscape design is the first part of a larger plan to enhance Blythewood Road with streetscape and redevelopment recommendations. These have the potential to transform the corridor into a pedestrian-oriented thoroughfare. To the east they include street trees, wide sidewalks, safe pedestrian crossings, buried utilities, and walk-up retail buildings. To the west the transition to more rural land is accomplished with recommended bio-swales and a multi-use path.